MACON, Ill. – It’s an open wheel weekend for dirt track racing fans with some of the nation’s best dirt trackers heading to Central Illinois for major events in POWRi midgets and USAC Silver Crown cars. 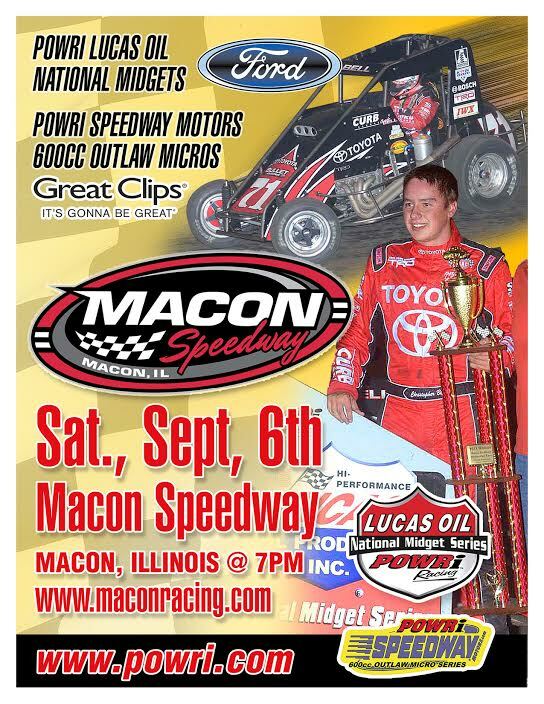 POWRi fans are already buzzing about the program at legendary Macon Speedway Saturday, Sept. 6, when the series holds double features in both Lucas Oil National Midgets and Speedway Motors Outlaw Micros. But that’s just the start. On Sunday, Sept. 7, the USAC Silver Crown cars roar onto the famed Springfield Mile at the Illinois State Fairgrounds for the rescheduled Tony Bettenhausen 100 following the incredible race at the DuQuoin Mile the previous weekend. That’s racing on one of the best midget tracks in the country – Macon Speedway was designed as a midget track when built in 1946 — before enjoying the historic Bettenhausen 100 on mile track, the superspeedway for dirt cars. The weekend even includes a special ticket offer. POWRi is one of the fastest growing dirt-track series in the country, and you just might find The Next Big Thing. Kyle Larson won a POWRi feature last season, and he’s now contending for NASCAR Rookie of the Year in Sprint Cup. Zach Daum of Pocahontas, Ill., leads the standings. Bryan Clauson, an Indy 500 qualifier in 2012, is also likely to compete. Justin Peck and Chris Bell sit on the front row of the feature lineup set during the April 26 program. POWRi will also run a complete program. Grandstands open at 5 with racing at 7 p.m. Tickets are only $15 for adults. Children 11 and under are free with parent. On Sunday, A.J. Fike of Galesburg, Ill., shoots for only the second three-peat in the 80-year history of the Tony Bettenhausen 100. Named after an Indy 500 star from suburban Chicago, the Tony Bettenhausen 100 didn’t have an Illinois driver win it in 29 years before Fike took the checkered flag in 2012. When he won it again last season, Fike could become only the second three-peat winner, joining Chuck Gurney (1989-91). Last weekend, Shane Cockrum of Benton became the first driver from Southern Illinois to win the DuQuoin Mile. Practice is set for 10 a.m. with qualifying before the race at 1:30 p.m. Grandstands open at 9 a.m. 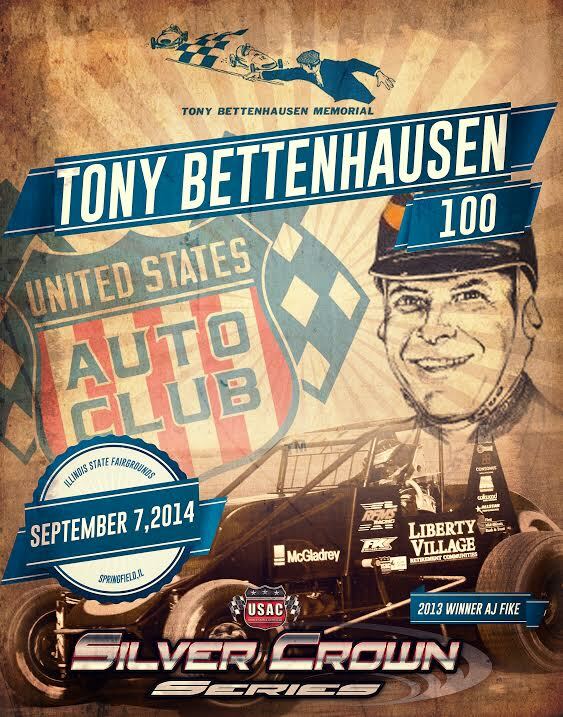 Fans attending the POWRi show at Macon Speedway may purchase Tony Bettenhausen 100 tickets for $15. Otherwise, call 217-764-3200 for regularly priced tickets at $30.